They say that imitation is the best form of flattery, but how much is too much? Would you feel flattered if someone started to copy you and attempt to do the things you are good at? What if they wanted to take credit for your work, or try to do "your" things because they think they are better than you? Would you feel the same way if it was a total stranger imitating you than if it was a family member or friend? How would you feel if you got the feeling that this person somehow wanted to be you? Okay, so on Saturday night at Penguicon we decided to check out the Black Sweater Party, which was participation in a hands-on SWAT team building. This was a blast as well. A Fallujah Marine came in and helped us. We spent two and a half hours of training on two-man and four-man team room clearing. Then we even got to throw mock flash bangs. We were shown the correct way to handle our guns, how to throw the flash bangs so they don't bounce back at us, and the proper way to enter and clear a room. They even trained us on four-person teams walking up and down stairs. It was a grueling two and a half hours. Then it came time to put our training to use. Intelligence informed us that terrorists had taken over the second and third floor of the hotel we were in. It was our job to take them out without disturbing the hotel guests. So we split our large group up into groups of four. I believe we had about three teams of four on each floor. My group was the last group to enter the second floor. It should have been a piece of cake considering two other teams had cleared the floor before we arrived. However, that wasn't the case. Our team of four was taken out by the enemy behind us in a matter of moments. Two and a half hours of training and only five minutes in the field. But it was fun. And in the end, the counter terrorists DID win. I can't wait to get back into the action next year. * If it ambles along and has inarticulate speech, it's most likely a zombie. * If it's a zombie, shoot it. * If you aren't sure if it's a zombie, shoot it anyway. If it doesn't get back up right away, it was probably human. In this case, a whispered note of apology is necessary; however, most likely the wounded victim or dead human will now rise as the walking dead. Shoot it again! * You don't have to outrun the zombies, you just have to outrun all your friends. 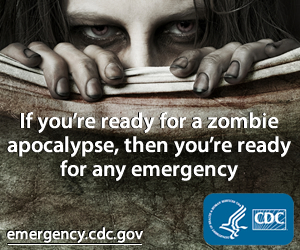 For more information on this very real threat, visit http://www.zombiehunters.org . If you just found out you had one month to live, what would you do?